The Super Bowl is this Sunday, so here’s a tasty and frugal idea for your Super Bowl party: veggie chips made from vegetable peelings! Yes, they are made from food that normally goes to waste. Unfortunately food waste is a global issue and it’s estimated that $984 billion is lost each year due to food waste, and it could be costing you about $1,800 a year too. If you normally throw out your vegetable peelings then this is a great (and tasty!) way to reduce your food waste. Clean vegetable peelings. I used peelings from 8 medium-sized potatoes, 6 carrots and 5 parsnips. When peeling the vegetables try to get some good length and thickness. Dry the peelings if they are excessively damp and then toss the peelings in some vegetable oil and salt until they are lightly coated. Bake the peelings until they are crisp (interesting side note: In the UK “chips” are called “crisps”). This should take about 20 – 30 minutes depending on the accuracy of your oven temperature. My oven runs cool, so it took almost 30 minutes to bake them. 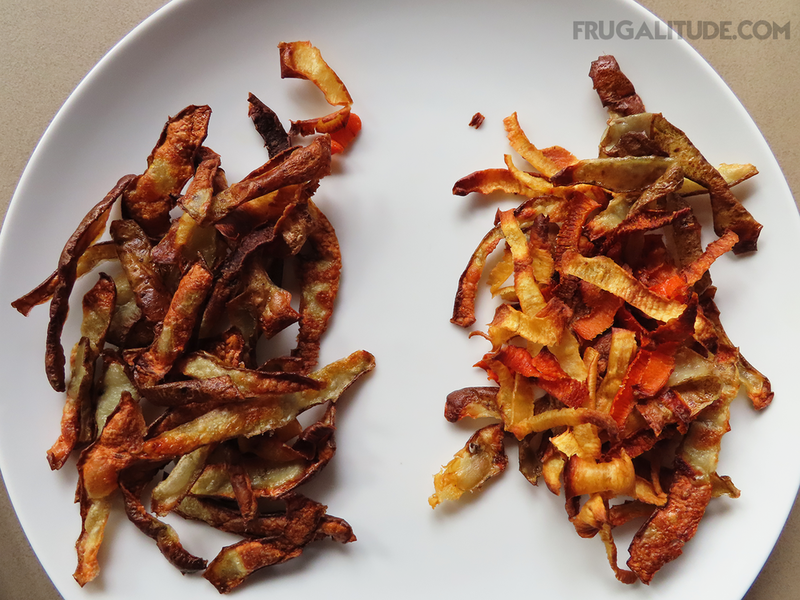 Overall, it took about an hour to make these vegetable peeling chips. Practically nothing! 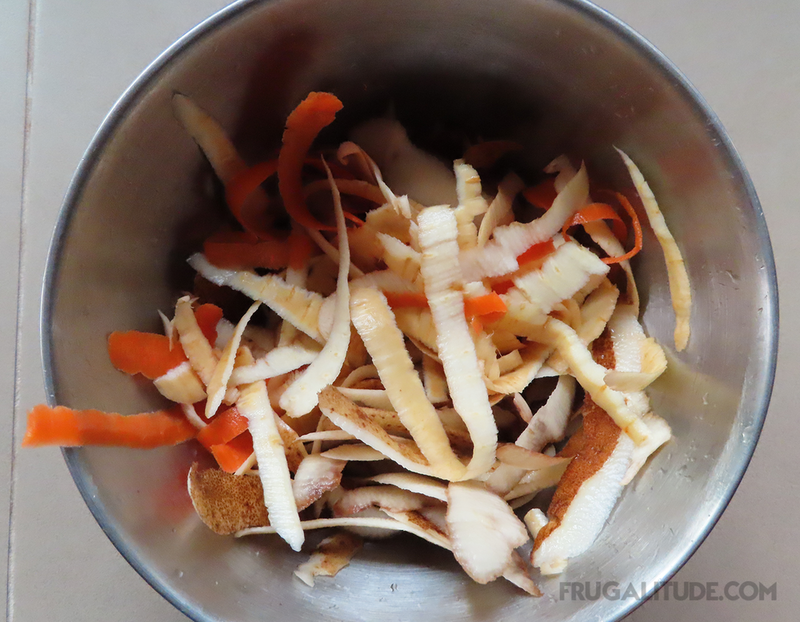 Since vegetable peelings are normally discarded (in my case I usually compost them or feed them to my worms) the only costs here are the oil and seasoning. Plus some electricity, but since we are a solar-powered household, that doesn’t cost us any extra! This is a tasty way to use up food that you would otherwise discard, and it could be a great technique to introduce your friends and family to the idea of reducing food waste. However, even baked, they are probably not the healthiest way to eat more veggies! So overall I would give these a 4-pig grading: something fun and delicious to do occasionally with vegetable peelings. Should I blanch the vegetable peelings before baking them? I did blanch some of the peelings before baking them, and then baked the rest without blanching. To blanch the peelings, I just cooked them in boiling water for about 2 minutes. 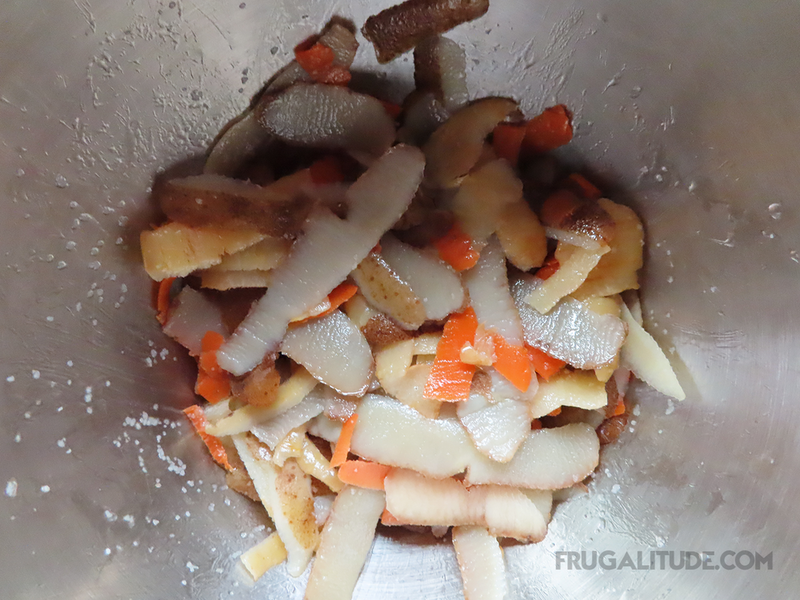 Here’s a photo of the difference between the 2 methods – the blanched peelings are on the left. As you can see, they don’t look quite as good, but they were a little crispier. Can I store my peelings and use them later? I wasn’t ready to use the peeling right away, so I stored them in a bowl, covered with water, in the fridge. The next day they were still fresh, so I would say you can keep them for at least a couple of days in the fridge, but I would recommend that you change the water once a day. When you are ready to use the peelings, drain the water and then dry them a little before adding the oil and salt. What other seasonings can I use? You could try onion or garlic powder if you want a different, savory taste. Or sprinkle with cheese just after baking. If you want more heat then try curry or chili powder. For a sweeter flavor, you could mix the peelings with sugar and cinnamon. Do I have to bake the vegetable peelings? Can I fry them instead? The peelings can be fried instead of baked. Just heat about 1.5 inches (4 cm) of oil in a pan over a medium-high heat and then fry the peelings in batches for about 2 minutes. Maybe I should test this in our air-fryer for a healthier option? Once fried you can season them. It can be easy to overcook the peelings so keep an eye on them around the 15- 20-minute mark and stir them from time to time to make sure they cook as evenly as possible. If you do overcook them, then they’ll end up looking like this: burnt and not very appetizing!